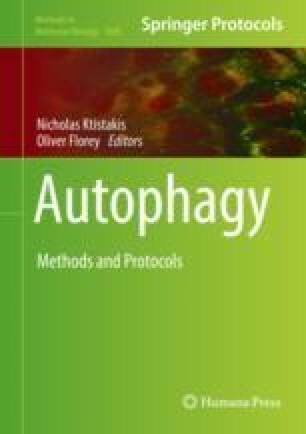 Macroautophagy is the process to remove intracellular organelles or proteins by using autophagosome that is composed of autophagy proteins such as atg3, atg7, and atg8/LC3 (Mizushima, et al. Annu Rev Cell Dev Biol. 27:107–132, 2011). Here, we develop a useful method for in vivo imaging of autophagosome under the two-photon microscopy. Time-lapse imaging of LC3-ECFP enables us to quantify the dynamics of number, size, and signal intensity of autophagosomes in neurons or in other types of cells in the brain. This work was supported by “Brain Mapping by Integrated Neurotechnologies for Disease Studies (Brain/MINDS),” “Strategic Research Program for Brain Sciences (SRPBS),” and a Grant-in-Aid for Scientific Research on Innovative Areas (Foundation of Synapse and Neurocircuit Pathology) from the Ministry of Education, Culture, Sports, Science and Technology of Japan. We also thank Drs. Kazuhiko Tagawa and Kyota Fujita for supporting ethics approval, technical development, and discussion.